﻿ This Month's Caravan Guard Gear Guide - SatNavs! This month we give our guide to satnavs for caravan and motorhome owners. The features to look out for, how to ensure you have your satnav insured and we even review a couple of portable satnav models. What could be simpler than a satnav? Just punch in details of your campsite and it’ll take you there. That’s the theory, and by and large that’s the actuality – it just pays to apply a bit of commonsense, that’s all. Satnav is the rather more snappy title for what really should be called GPS technology – GPS standing for Global Positioning System, which uses global satellites to pinpoint your exact location, even as you move. 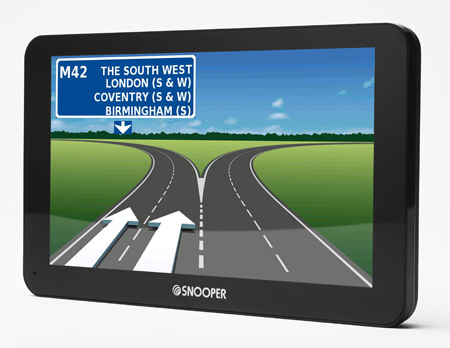 Satnavs come complete with mapping software that gives you step-by-step directions to your chosen destination. And there’s plenty of choice all the way up to ever-sophisticated models that can offer more than just guidance. It’s certainly a good idea to try and find somewhere where you can compare and contrast a number of different makes and models. It will give you a feel for what you want to see in terms of the view on the screen (there’s 3D as well as 2D, for example), and indeed how the touchscreens themselves work. Finally, tempting as it might be to do away altogether with a traditional atlas, it’s still a good idea to take one with you on your travels. Satnavs aren’t infallible – yet. Satnavs are getting bigger. Generally, the trend is towards a 5in screen (as measured, TV-style, from corner to corner). Caravanners you may want to consider what’ will fit best on your towcar dashboard. For motorhome owners, there’s typically more space in a motorhome cab, and you may well find the satnav unit itself is mounted quite a distance from you. So, do consider a larger screen. 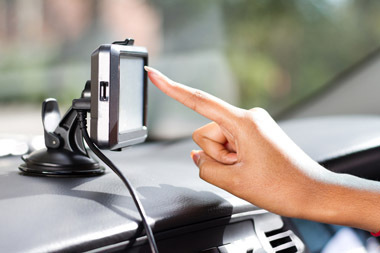 A typical portable satnav package will also include a 12V charger connector cable (check it’s long enough for motorhome use; they usually are), suction pad (for mounting to your windscreen or a self-adhesive disk to go on top of your dashboard), and instruction manual (although sometimes these are included in the satnav itself rather than as a printed document). Advance Lane Guidance A temporary screen display that highlights which lane you should be at key junctions on your route. As a caravan owner, your satnav won’t be classed as caravanning equipment under your caravan insurance policy – afterall it’s not something you use inside your caravan! Your towcar insurance may offer a limited amount of cover for personal belongings but check that the policy limit is enough to cover the satnav you have bought as it’s usually restricted to a few hundred pounds. If the cover limit is insufficient on your towcar policy, you may want to consider taking out specialist gadget and leisure equipment cover to cover your satnav along with your other electronic gadgets and pedal cycles etc. Bear in mind though on either your car or a gadget policy there will usually be a condition that the satnav is kept out of sight inside a locked compartment in the car when the vehicle is unattended. For Caravan Guard motorhome policyholders, portable satnavs that are kept in the motorhome can be covered as motorhoming equipment (up to a value of £300). This means that if your motorhome is targeted by thieves and your satnav is stolen, or damaged accidentally, it will be covered on the policy as long as it is kept out of sight in a locked compartment when the motorhome is unattended. If your portable satnav is worth more than £300 and was stolen, the maximum you would be paid out is £300 due to our policy’s single article limit for motorhome equipment, so in these cases a specialist gadget insurance policy may again be a good choice. Satnavs that are built into a motorhome dashboard are covered as part of the motorhome structure. 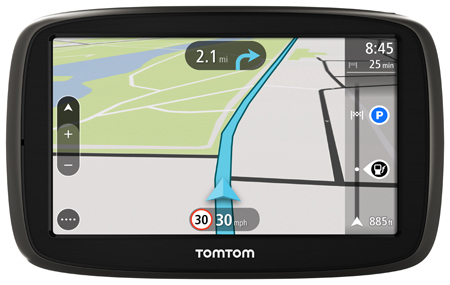 It was at the end of summer that TomTom launched its new START range, offering a comprehensive line-up of models with screen sizes ranging from 4in to 6in and prices from around £90. As the name suggest, it’s a range of lower priced, lower specification models compared to its VIA, XL and flagship GO LIVE units. New features, as included in the START 50 model here (there are also 40 and 60 variants), include Quick Search (where you can tap on the map for an almost instant route) and a new route bar featuring essential travel information. It also comes with TomTom’s EasyPort mount which folds relatively flat for carrying in your pocket and/or easy storage. The model here features UK and ROI (Republic of Ireland) mapping with lifetime upgrades – pay around £20 more if you want the rest of Europe. You also get free mapping updates for the life of the unit. Here’s a first. This very latest model from Ventura – the company that originally gave us the facility to enter our vehicle’s dimensions and weights etc, so when a route is calculated you know you’re not going to encounter low bridges, narrows lanes etc perfect for caravan and motorhome journeys – even includes tyre pressure monitoring. It’s an optional extra, at £109.99 but it could well be worth it for the extra peace of mind it brings. Screen size makes units like this more suitable to larger motorhomes. Meanwhile, the integral FM transmitter allows instructions to be heard via your stereo’s speakers – a useful facility if your cab is especially noisy. Likewise, use the Bluetooth connection to connect up to your mobile phone. Also in this package is a database of some 24,000 campsites throughout Europe. Much of this is available thanks to another recent tie-up for Ventura, with Alan Rogers (the travel service and campsite inspection operator that’s now part of the Caravan Club). Other specialist motorhome accessories retailers offer satnavs for sale, often selected because of their suitability for leisure vehicle use. General advice is it’s best not to put your proper address in the “home” setting. If the unit does fall into the wrong hands, it’s an obvious place to look to find out exactly where you live. Also, remember to hide your satnav system, including any bracket etc, out of sight when you’re not using it. It just reduces the temptation for would-be thieves. Caravan Guard Gear Guides aim to give you an introduction to a specific product type. But, we’re always keen to hear from you if you want to share your experiences and/or key advice with other online readers. What satnav do you have and do you recommend it? See below to add your comments. try Noza tec on Ebay they are a lorry sat nav you can put in the size of your motorhome or if you have a caravan put the size of your car in and then the trailer your caravan becomes the trailer.They come in 5&7inch screens all for £40 to £50 have a look they are well worth it, used it with both motohome &caravan. Seems a bit silly to recomment the TomTom Start for caravan/motorhome as it will route down single track lanes quite happily! We’ve had a couple of car tomtom’s, a Snooper S5000 and now have the TomTom Camper and Caravan edition. Frankly they are all pretty poor at selecting suitable routes for motorhome, so my advice is use as a guide but check route before and make sure any tricky sections you have worked out before, with tomtom I set a favourite as a travel via location to avoid anything that looks unsuitable but its very annoying they can’t sort their mapping out (which is bought in from specialist mapping companies so the satnav maker has no control over). When are you going to a page on 5th wheelers for all the members with 5th wheel. We actually launched fifth wheel insurance earlier this year, see here or here for further details. If it’s fifth wheel reviews you’re after, we covered the Celtic Rambler recently here.